BOGOTÁ, Mar 13 2014 (IPS) - In July 2004, when paramilitary leader Salvatore Mancuso was demobilising, he admitted to the Colombian parliament that the illegal extreme rightwing forces controlled 35 percent of the seats. Ten years later the situation is very similar: one-third of the new senate, where congressional power mainly resides, is allegedly linked to the paramilitaries. These are the conclusions of the non-governmental Peace and Reconciliation Foundation’s monitoring of candidates in the congressional elections of Sunday Mar. 9. The former president, himself also under investigation for alleged links with the paramilitaries, was angered by the announcement of the peace talks. Thirty-three candidates related or allegedly related to paramilitary forces active in the Colombian armed conflict were elected to the senate, equivalent to 32.4 percent of the 102 seats. In the lower chamber, 37 were elected, or 22.3 percent of the 166 seats, the Foundation said. They are the heirs of politicians related to paramilitarism (the parapoliticians, in local terms, dozens of whom have been tried and convicted), or they are alleged to have direct links with the criminal organisations that took over after the paramilitaries demobilised under then president Álvaro Uribe (2002-2010). 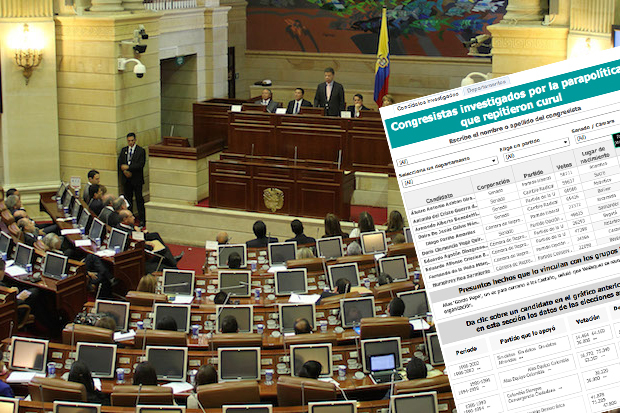 The specialised web site VerdadAbierta.com (OpenTruth) says that 15 politicians elected to the senate were under investigation for allegedly making pacts with the paramilitaries, while 11 under the same suspicion won seats in the lower chamber. This Congress, elected by Colombians with an abstention rate of 56.42 percent, is potentially the most important in half a century. Apart from the abstentions, among the 14.3 million people who did cast a ballot, over 2.3 million votes were invalid, and 885,375 electors cast blank votes, more than six percent of the total, following a campaign over the social networks promoting this protest action, according to preliminary official data. This means that lawmakers elected by a minority in this country will decide what happens to the accords that could end a civil war lasting 50 years, and debate new bills arising from the negotiations. With international mediation, the government of President Juan Manuel Santos is holding peace negotiations in Havana with the leftwing FARC (Revolutionary Armed Forces of Colombia) guerrillas, a peasant movement that took up arms 50 years ago. The negotiations have already reached preliminary agreements on two of the six points of the agenda: comprehensive rural development, and political participation. Progress has been announced on another point, solving the problem of illicit drugs. The remaining points are: ending the conflict, victims and truth-telling, and the implementation of the agreements themselves as the sixth and final point of the agenda. Santos has also been engaged in a long-drawn-out exploration of possibilities for rapprochement with the pro-Cuban National Liberation Army (ELN) in Colombia. Talks with this guerrilla group, the second in size by number of combatants, is apparently still at the stage of agreeing an agenda for negotiations. But no party obtained more than 20 percent of the vote, and divisions persist among the elites between support for a negotiated solution and the pursuit of a military outcome. This is one reason why the peace talks have been able to make headway. Juan Manuel Santos, in office as president since 2010 and now running for reelection for 2014-2018, has achieved significant political consensus in support of his peace efforts, with a five-party National Unity coalition made up of Partido de la U, Cambio Radical, Partido Conservador (all three of the right), Partido Liberal (centre) and Alianza Verde (centre-left). The coalition has 80 of the senate’s 102 seats, 100 of which are disputed nationally by the parties and the other two set aside for indigenous people’s candidates. Santos leads voting intention polls for the presidential elections on May 25 by a wide margin. But analysts say he will have to go to a runoff ballot on Jun. 15 to win victory. If the result bears out the polls, Santos would begin his term with a parliament, installed Jul. 20, with 46 senators in his support, not counting the conservatives, who are divided for and against the peace talks, and he would control the lower chamber, with 92 out of 166 members. No doubt the Partido Conservador, which went from 22 to 19 seats, will again hold the balance of power, and will demand bureaucratic posts and contracts for its activists in exchange for its support. Four of its elected parliamentarians are under investigation for alleged paramilitarism. The Partido de la U dropped from 28 seats to 21 in the senate, but continues to be the most voted party. Eight of these senators are under investigation for paramilitary connections. Cambio Radical rose from eight to nine seats, with four elected members under investigation. The Liberals maintained 17 senators, seven of them with alleged paramilitary connections. Alianza Verde, for its part, still has five senate seats, one of them to be occupied by Claudia López, the main investigator of links between politics and paramilitarism. According to Verdad Abierta, 16 percent of elected members of Congress for Cambio Radical and 14 percent of those for Partido de la U are under investigation for paramilitarism. Another party that has supported some of Santos’ initiatives, Opción Ciudadana, is strongly criticised for links with far-right paramilitarism and 27 percent of its lawmakers are under suspicion. The centre-left Polo Democrático Alternativo fell from five to three senators. This small bloc, which expelled the Partido Comunista from its ranks, could be an ally in the peace process. According to some analysts, the biggest threat to a negotiated peace now comes from Uribe’s new extreme rightwing party Centro Democrático, which basically won the 19 senate seats lost by the Partido de la U and the Partido Conservador combined. Uribe wants a military defeat of the guerrillas to force them to surrender their weapons, and to sentence them to prison terms in accordance with their crimes, without adopting measures of so-called transitional justice and without political rights, which would cause the collapse of the peace negotiations. The dimensions of the conflict are shown by justice system and journalistic investigations indicating that Santos and his peace negotiators were spied on by military intelligence agents loyal to Uribe and possibly linked to human rights violations. Uribe did not achieve his goal of winning one-third of the senate, but the Centro Democrático has more than 14 percent of senate seats and is the second strongest party, with over two million votes.